Overlooking the dramatic coastline of Big Sur, Kirk Creek campground is located near Julia Pfeiffer Burns State Park and Sand Dollar Beach. Yes, it’s location says it all. You’ll probably stay at the most beautiful section of Highway 1 along the California coast. 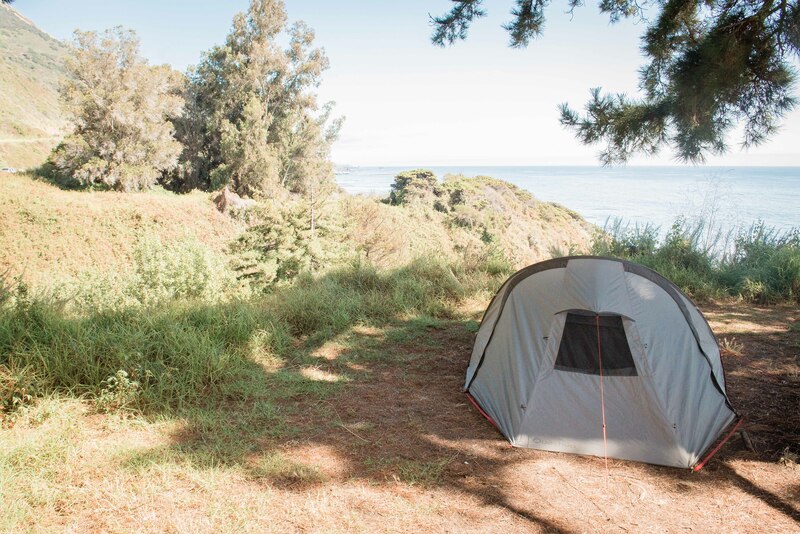 Book this campground for the ocean view! In the distance, we even saw some whales surfacing. For a spot at Kirk Creek, you have to count $25. Do keep in mind that the camping facilities are limited. There are only vault toilets and unfortunately not so well maintained. So be sure to bring your own toilet paper. The same applies to water, as there is no available on the site. A camping shower bag is useful here! We bought one at Walmart for about $10. Each site does have a picnic table and a fire pit with grill. From the campground map it is clear which sites you should choose to enjoy the best view: the ones immediately to the sea side. The other sites have a bit too much bushes to fully benefit from the view directly from your picnic table. ‘Book early’ is the message! It’s a rather small campground and the campsites fill up quick. We stayed at site 5: partial ocean view – however the nearby sites are even more impressive – and very spacious. 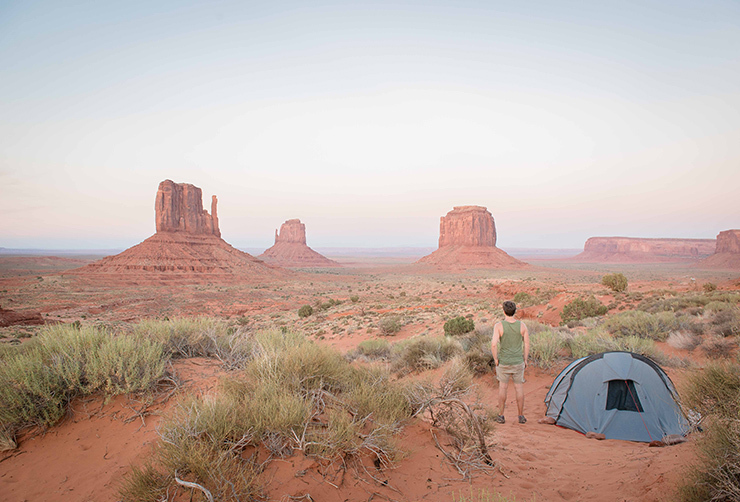 If you still can choose; our favorite campsites are sites 7, 8 and 9. They are spacious, secluded and offer an awesome panoramic ocean view. But hey, in Kirk Creek you can’t really choose wrong though. June Lake clearly is an extension of Yosemite National Park. Surrounded by snow-capped peaks, the aqua blue lake is pleasing to the eye. The campground Oh Ridge is elevated so you can enjoy a beautiful view on this gem. From there it is only a 5 minute walk to the beach where you can go swimming, fishing, canoeing, or just relaxing. There are also several hiking trails nearby. 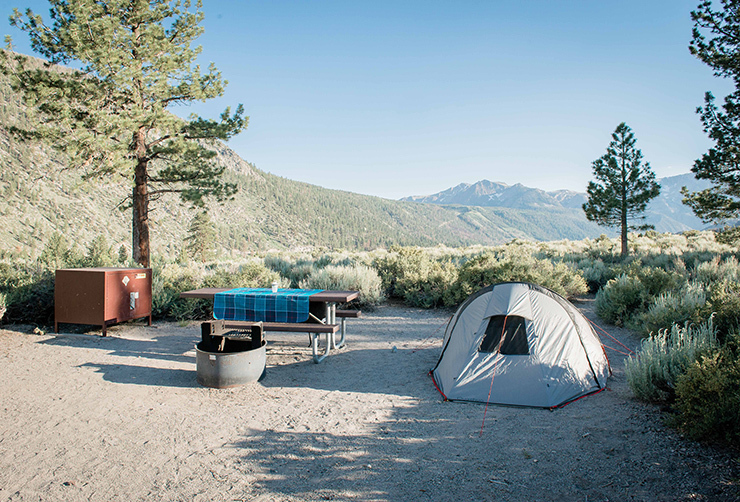 For a campsite, you pay $25 a night incl. tax. You’ll get a beautiful spot with a picnic table, grill, fire pit and bear box to store your food. Please note: most sites have little to no shade, some do have a windshield. Drinking water is available, as well as clean toilets and sinks. Showers are not available on the site itself, but you can find them next door at the Pine Cliff Resort – $1 for 7 minutes hot water. For RV campers: campsites can accommodate 40 feet vehicles. There are no full hookup sites. There are many sites that have a direct view of the wonderful June Lake, but not all sites. So if you can, pick one of these sites: 6-12 (Bear Loop), 27-30 (Duck Walk) or 36-44 (Squirrel Loop). The rest has little or no view of the lake, but do all have a nice view on the surrounding mountains. From the Bear Loop it is a bit of a walk to the camping facilities. We stayed at site 42 in the Squirrel Loop in a tent. Tip: Be sure to check out the night sky, you’ll be amazed by the beautiful scenery! Moreover, the Wildcat Trailhead is just near your sleeping place! It is a nice walk, you can do without a guide and – for us – has more to offer more than the Scenic Drive by car. We recommend starting the hike just before sunset, when the sunlight plays behind the buttes. The campsites are all open and exposed, so without shadow. No hook up sites. The facilities are decent. There are toilets, sinks and (free) showers. Attached to the reception, there is a small shop where you can get some supplies. However, it is easier to visit a Walmart before entering the park. A tip for tent campers: Most places have a dusty sandy bottom. It will get among your camping gear quite easily. At site 14 that was much less the case, so this is probably the best choice. For the view, you do not have to choose. It is just wonderful from all sites! For one night at this unique location, you pay $21. Please note that in addition to the price for a camping site, you must still pay for the access to the park ($20 per car). In addition, the Annual Pass is not valid here because the park is managed by the Navajo Indians. Forget Half Dome… Hike Cloud’s Rest!